What Happens if Freeport Rallies? There’s something happening in the Materials space today that is worth mentioning. First of all, lets just agree that this is the most hated space in the world – gold miners, copper, and materials in general. They’ve been getting crushed with emerging markets all year while staples and healthcare rip higher here in the states. Freeport McMoran has always been my go-to name when it comes to this world. You’re getting a healthy combination of gold and copper in one 30 billion dollar stock. Over the last couple of weeks, we’ve been monitoring $FCX as it tests/breaks this multi-year support. The mentality is that a severe breakdown in this name could have massive implications for the global macro environment. If this thing goes into free-fall, risk assets as a group are probably in big trouble. The economic implications of more copper selling, combined with our favorite stocks being used as a source of funds for global margin calls would be a major problem. Now let’s just take the other side of this for a minute. What happens if Freeport doesn’t break and collapse? What happens if gold and copper finally catch a bid? 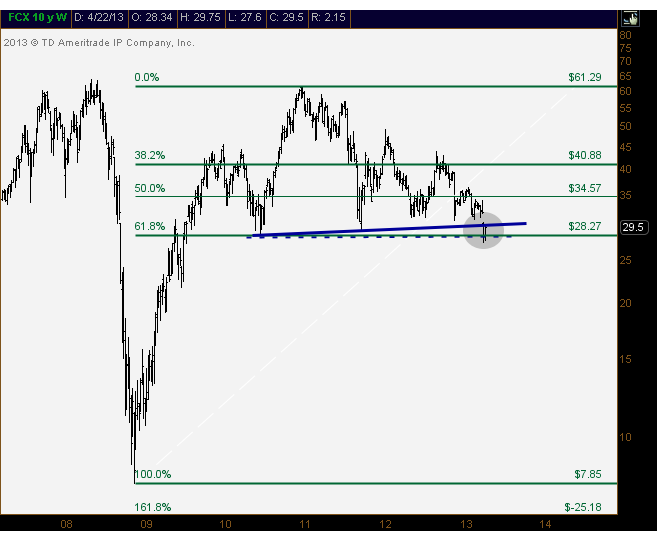 Can $FCX actually squeeze higher? What would renewed strength in materials and emerging markets do to risk assets, and particularly sector rotation within US Stocks? I’m not suggesting one is going to happen and not the other. But simply pointing out that there is something significant happening right now in a very important name. The resolution here will probably impact the near future of the marketplace and what you’ll be reading about on the beach this summer.